No, Video Games. 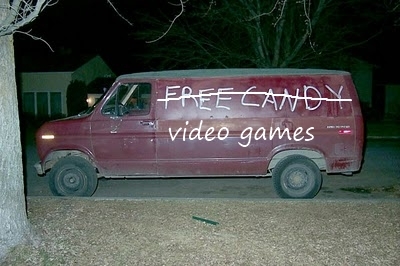 I Will Not Get in the Van. Please stop punching me in the discipline. Let’s face it. I’m a weak, weak man. When Skyrim came out, I wanted very badly to spend my days pretending to be a half-naked guy in the freezing cold wearing a metal hat with a couple of cow horns glued to it. But, because I’m heroically dedicated (hahahaha), I managed to pull myself away. Well, dedicated in the sense that I very much want to avoid having virtual tomatoes thrown at me for missing my next deadline. Then, immediately after my hard-won moral victory, Batman:Arkham City came out. Ouch. Wore tights for like, one night. Then I averted my eyes and put it away for good. I may have cried a little in the process, but it was still a victory, dammit. Last month, my friends all started playing the new Star Wars MMO, The Old Republic. AND THEN THEY STARTED TELLING ME ABOUT IT. In breathless, exciting detail. I had to wrap them in duct tape and lock them in the closet, but it was worth it. Well, to me, anyway. Temptation avoided. And now this. Gabe and Tycho are super awesome, but must they, too, try and lure me into the Unmarked Van of Slacking Off? Et Tu, Gaming Icons? Kingdoms of Amalur launches next week. And the demo is out now. A demo in which you can get in-game items for the actual game. Just by playing it.